Ron and Victoria were wishing for an elegant home in the trees at their lakeside property near Cadiz, Kentucky. This couple loved the aesthetic of the architectural legend Frank Lloyd Wright, and asked Pete to take Wright's famed prairie style into the trees. Pete and Daryl happily accepted the challenge, and loved integrating Wright's aesthetic into a tranquil treehouse that beautifully celebrates the nature around it. With cantilevered roofs that double as sun decks, three levels, a full kitchen, tiled bathroom, master bedroom, sleeping loft, living room, and lounge, who wouldn't love living in this Wright-esque treehome? Wright's horizontal aesthetic is evident in the facade and long ramp leading to the front door. A combination of oaks, beach trees, and pressure-treated wooden posts supports the 650-square-foot treehome. X bracing adds additional stability underneath the platform. This luxurious treehouse contains a full kitchen. Long, exposed beams and lots of warm wood radiate Frank Lloyd Wright's signature style in the master bedroom. The use of natural materials like stone and wood in the full bathroom creates a restful, spa-like feel. Interior designer Tory Jones did a stellar job filling the treehouse with beautiful, Wright-style furnishings and artwork. Read Tory's "Behind the Design" article on Animal Planet's Treehouse Masters Facebook page to learn more about her inspiration and finds. Tory Jones added this gorgeous Taliesin III table lamp from the Frank Lloyd Wright Trust. Guests can take a ladder to the cozy second-floor lounge, where they relax with a drink from the bar cart. The waterproof, cantilevered roofs double as ample deck space. A final ladder takes guests up to the sunroof, where guests can soak in views of Lake Barkley below. 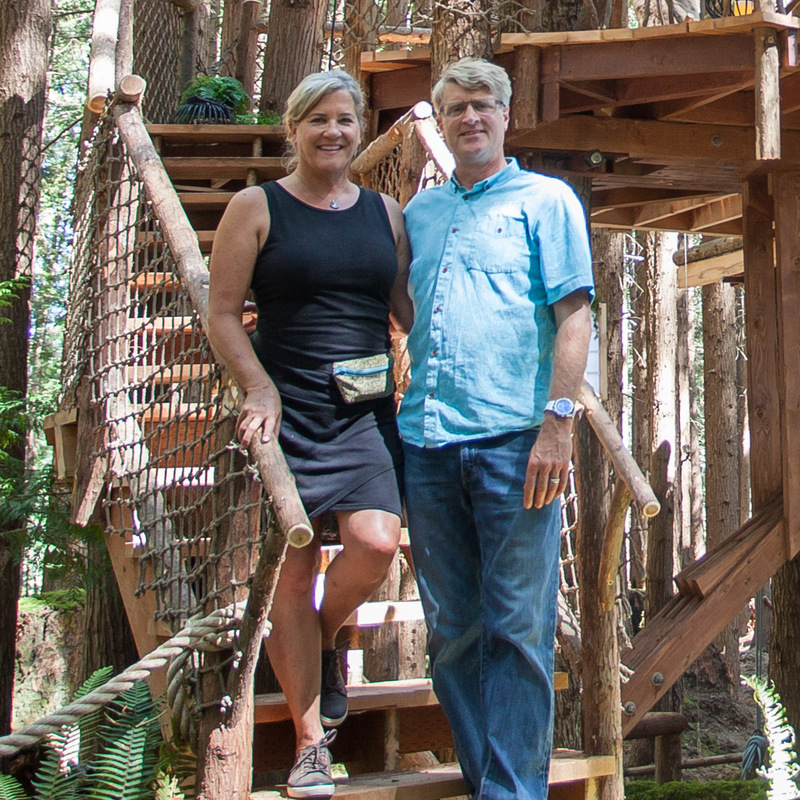 Bringing Ron and Victoria's dreams of a Frank Lloyd Wright-themed treehouse to life was an inspiring and exciting challenge for Nelson Treehouse and Supply! Wright's signature style sure translates to the trees, and makes for a calming, elegant, and beautiful treehome. For another look at the treehouse, watch Animal Planet's Treehouse Masters Behind the Build video. Let us know your favorite part of the Frank Lloyd Wright Lake Treehouse in the comments below! Join our newsletter and follow Nelson Treehouse and Supply on Instagram and Facebook to stay updated on treehouse builds.